Reverse: Short voided cross to inner circle with 4 pellets in each quadrant. Legend unclear. 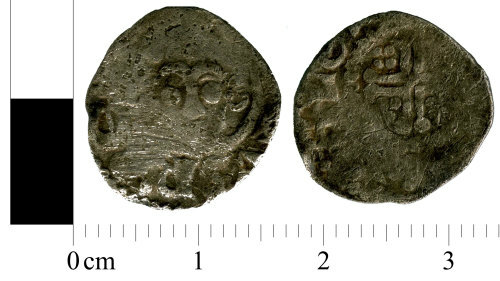 Identified by Robert Page: "Given the shape of the eyes and eye-brows this is almost certainly a class 8 coin." Obverse description: Crowned bust facing. Sceptre in right hand. Reverse description: Short voided cross to inner circle with 4 pellets in each quadrant. A silver short cross penny of Henry III, Class 8, c.1242-1247.